Sonia Malani is a third year student at Bastyr University, pursuing her passion for patient care and health promotion as a Doctor of Naturopathic Medicine candidate. Upon completing her undergraduate years at New York University, Sonia eventually swapped coasts to attend Bastyr after discovering the discipline through her father’s struggle with Stage 4 cancer. 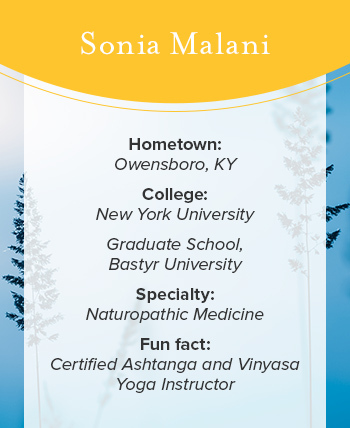 Alongside her role as the Integrative Therapeutics Student Representative at Bastyr, Sonia continues to develop her skills as a Yoga instructor, having trained in both New York City and Mumbai, India, and hopes to bring this passion to future doctor-patient interactions. Question: What brought you to Bastyr? When I got home that night, I looked it up, never having heard of naturopathic or integrative medicine before. As I was reading the six naturopathic principles, I found that it basically summed up the philosophy through which I lived my life. I went back to NYU, switched my major from Political Science to Pyschology/Pre-Med and a year and a half later I ended up at Bastyr. I’ve been so grateful to have this experience because I’ve learned so much about myself and found an amazing community of like-minded individuals with common goals. I’m definitely not the same person as I was coming in as a first year. What about Bastyr’s philosophy speaks the most to you? I find that their philosophy is really what sets us apart. It’s truly about seeing the patient as a whole person, looking at the root cause of what has happened in their life to bring them to this point. What is their world view? How do they see things? Because that’s going to be the way they process everything, including their treatment plan. You really have to learn to be a good listener and learn how to create a space for them to heal. Alongside that, how much are we, as healers, looking inwards? One thing I’ve heard a lot from doctors is, “You can only take someone in healing as far as you’ve gone yourself.” We need to do our own healing as well. The philosophy really sets us apart from just being a tool based medicine. We are well versed in our tools: botany, physical medicine, homeopathy, among others, but our philosophy is the hand in which we hold the tools. It’s an entire way of thinking. I recently did an activity in class about discovering your own core values. I realized that once I was able to articulate what my values were, I was able to align my actions a lot more clearly to them. All of these experiences give us, as students, genuine wisdom and knowledge to impart on our future patients. The philosophy has even changed how I viewed the profession. When I first came to Bastyr, all I saw myself as was just a naturopathic doctor. I boxed myself into one specific path and what I’m realizing now is that Bastyr is teaching me a skill set. It doesn’t necessarily just have to be a patient care model. It can be organizations, it can be philanthropy, it can be about anything. It’s a way of looking at life, and I can apply it to any industry if I truly embody that philosophy. What’s a day in the life like as a naturopathic medicine Bastyr student? A typical day is trying to maximize every moment I get. I usually wake up around 5:30 am. I implement a very strategic self-care morning routine to set the precedent for the day. I start with yoga in the morning. It gives my body the space to move and it also gives me the mental space to set an intention for my day. From there I typically have class from 8-5 and/or a shift at Bastyr Clinic for Natural Health. Afterward, I’ll take some time to myself to decompress from the day and do something that rejuvenates a little bit of my own energy. I like cooking, which is therapeutic for me, plus the farmers markets in Seattle are amazing! I’ll listen to podcasts when I cook which I feel is the cheapest education I’ve ever gotten. After that there’s studying, checking in with family and friends, and preparing for the next day. It’s consistently fourteen hour days of non-stop going, but I’ve accepted that this is a season of my life. Everything comes and goes in seasons, and this is a challenging, but equally rewarding one. Any recommended podcasts for other students? A majority of my podcast education is business oriented because I really want to start a practice that not only is successful, but is also sustainable and adds value to the field of naturopathic medicine. There’s a great podcast from an ND, Andrea Maxim, called The Profitable Practice Podcast. She covers everything from networking and maximizing your social interactions to juggling a family while running a full time practice, stuff that can’t be found in our textbooks. Another of my favorites is the Tim Ferriss Show. His interviews are full of both clinical and life pearls. I’m spending four years of my life learning to be a doctor. I’m not spending it to learn business, so it can be hard to do both at the same time. I wouldn’t consider myself business savvy, so it’s an area that I’m definitely trying to work on. I would love to eventually create a model for future naturopaths so they don’t have to juggle both halves, and they can focus on just being a doctor. Where do you see the future of integrative medicine for your generation? Are there any barriers that need to be overcome in order to achieve that future? When evaluating the barriers of naturopathic medicine, I try to look at the situation as naturopathic doctor. What is the underlying cause of the problem? I think one of the biggest preventative measures we can take is by nurturing leaders in my generation who are not afraid to push the barriers of the current healthcare system and are willing to reevaluate and continuously improve. That isn’t an easy thing to do but it’s important for our own development as individuals, and for our development as a profession. Follow the path of a Bastyr University naturopathic resident and a community clinic supervisor. Personal Insights is a series of profiles on the people and institutions leading the movement forward, breaking down the barriers between integrative care and everyone who needs it. Integrative Therapeutics is committed to supporting these initiatives, because we believe everyone deserves options to choose their ideal path to health and happiness. All opinions expressed are those of our subjects.